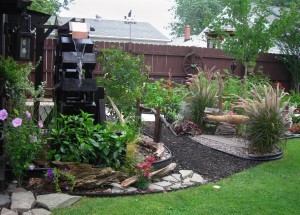 A waterfall, pond and giant water wheel beguiled visitors to the backyard of John and Joanne Perrello at 2674 Colvin Blvd., Town of Tonawanda, during the Ken-Ton Garden Tour on Saturday and Sunday, Aug. 7 and 8. While they grew vegetables for about 30 years, the Perrellos started the water features just three years ago, beginning with the waterfall, which you can see in the background of the first photo. They put in the pond, which you can see in the foreground, in the spring of last year. 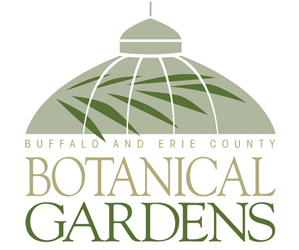 The Perrellos have many tips to share with other gardeners about adding water features to their yards. 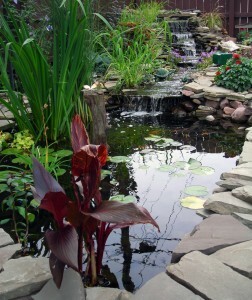 First, while you may want to put a waterfall near a fence, you can’t build it directly against the fence, John said. Instead, you must build a retaining wall. Even the retaining wall shouldn’t be flush against the fence; you want to allow air to circulate so the fence doesn’t rot (see photo at right). 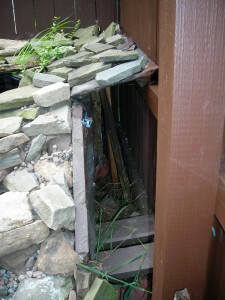 John used 2×10’s to build the wall, which you can see against the stones. The wall is stabilized by chains staked into the ground in front of the wall where the waterfall will be located. (See sketch below.) 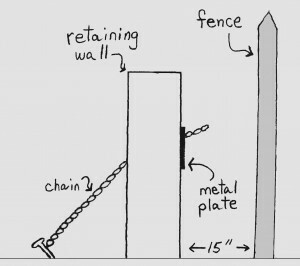 A steel plate reinforces the wall where the chains are attached. Chains are also staked into the ground behind the wall. To keep colorful flowers in your water feature, try this tip. 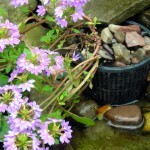 Take a pond plant basket and place stones in the bottom. Buy a Whirlwind Blue scaveola hybrid, an annual, and remove some of the dirt. Place the plant in the basket and add more stones. Set it in your water feature, making sure it’s in about a half inch of water. 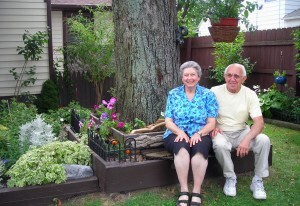 Another of John’s building projects is the giant flower box that provides seating for him and Joanne in the photo below. He constructed it as a way to hide the large tree. 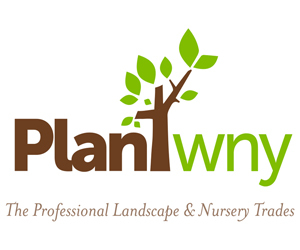 Joanne is the one who maintains the amazingly manicured gardens. She is out every day, for at least two or three hours. “Otherwise, the weeds would take over and I don’t even want to go out there,” she said. Joanne chooses reds, pinks and other bright colors for her flowers. “The brighter, the better,” she said.